Perfect for multipurpose use for your babies. Cleans all food stains on hand ,mouth & face of the baby. 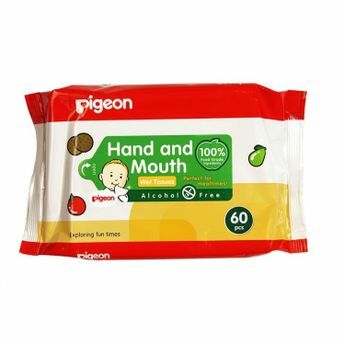 100 % alcohol free wipes. Formulated with 100% food grade ingredients. Effectively clean hands and mouth before and after meal. Perfect for multipurpose use for your babies, Can clean fruits & vegetables before eating. Suitable for mealtimes indoor and outdoor uses. It is safe enough to be used on babies, toddlers and adults. Explore the entire range of Cotton Buds, Balls & Wipes available on Nykaa. Shop more Pigeon products here.You can browse through the complete world of Pigeon Cotton Buds, Balls & Wipes .